In the year 1801, Italian astronomer Giuseppe Piazzi discovered a new planet in our solar system between the orbits of Mars and Jupiter. Named Ceres, this new world was far smaller than the other planets, but unlike a moon it orbited the sun directly. The next year, astronomers found another small planet, also between the orbits of Mars and Jupiter, and named it Pallas. In 1804, yet another small planet, Juno, was discovered and then another, Vesta, three years later. By the middle of the nineteenth century, 15 of these minor planets had been located. Around that time, astronomers began to reserve the term planet for only the largest eight worlds of our solar system, and from then on, the newly discovered small worlds were called asteroids. Today, astronomers have discovered and catalogued hundreds of thousands of asteroids. They revolve around the sun primarily in a “belt” between the orbits of Mars and Jupiter. The term asteroid belt may conjure images of a thick band of billions of rocks tumbling and colliding—surely a hazard to any spaceship that would dare pass through such a region! Science fiction reinforces such notions; consider the spectacular asteroid chase in the cult classic The Empire Strikes Back. But the real asteroid belt doesn’t appear this way at all. Although there are likely millions of asteroids orbiting the sun, the volume of space in which they orbit is enormous. So, the average separation between any two asteroids could be hundreds of millions of miles. In other words, if you were standing on an asteroid, you probably would not even be able to see another asteroid with the unaided eye because they are so far apart. Ceres is the largest asteroid by far. It is 590 miles in diameter, about one-fourth the size of the moon, and is composed of rock and ice. The orbit of Ceres is nearly circular at an average distance of 257 million miles from the sun, giving it a 4.6-year orbital period. Other than its large size (compared to the other minor planets), Ceres is a fairly typical asteroid. Unlike the smaller asteroids, Ceres has sufficient gravity to force it into a spherical shape—just like the planets. For this reason, Ceres is also classified as a “dwarf planet.” Since all the other asteroids lack sufficient gravity to maintain a spherical shape, Ceres is the only asteroid that is also a dwarf planet. The second-largest asteroid by volume is Pallas.1 However, the second-most-massive asteroid is Vesta. It is only slightly smaller than Pallas but is significantly denser. Vesta orbits at an average solar distance of 220 million miles in a nearly circular path. It is the only asteroid regularly visible with the unaided eye, but only at its closest approach to Earth, when it appears as a faint star. We now have detailed images of Vesta, courtesy of the Dawn spacecraft that orbited this asteroid from 2011 to 2012. The images reveal a large, not quite round, cratered boulder in space. A handful of other asteroids have been visited by spacecraft. These include Gaspra, Eros, Itokawa, Lutetia, Mathilde, Steins, and Ida. Spacecraft provide high-resolution images of these tiny worlds that would not be possible with Earth-based telescopes. When the Galileo spacecraft flew past Ida, images revealed that this asteroid had an orbiting moon, which was named Dactyl. Dactyl is less than one mile in diameter, about one-twentieth the size of Ida. Since then, many other asteroid moons have been discovered. Most asteroids tend to orbit relatively close to the plane of the eight planets, but a substantial fraction do not. Almost all asteroids orbit the sun prograde—the same direction as the planets. Less than 100 known asteroids are retrograde. Asteroid orbits can be nearly circular or highly elliptical. Despite their many numbers, the combined mass of all the asteroids is estimated to be less than the mass of the moon. Asteroids can be classified either by their composition or by their orbit. Usually, the former can only be estimated by spectroscopic analysis. There are three common asteroid composition groups: group C (carbonaceous—the most common type, accounting for three-quarters of all asteroids), group S (stony/silicaceous—the second-most common), and group M (metallic), along with a handful of rarer types. There are also subcategories of the main groups. Classification by orbit is simpler and determined from observations. Most asteroids orbit between Mars and Jupiter without crossing the orbit of either planet. These are “main belt asteroids.” But there are several other orbital classes as well. In most cases, each class is named for the first asteroid discovered of its type. The last two classes of near-Earth asteroids are the Apollo and Aten groups. These asteroids actually cross the orbit of Earth. Those in the Apollo class have an average distance to the sun larger than Earth’s and, consequently, an orbital period longer than one year. But due to their elliptical path, they occasionally come closer to the sun than Earth does. About nine out of ten of the Earth-crossing asteroids are of the Apollo class. The rarer Aten-class asteroids have an average distance to the sun smaller than Earth’s, a period smaller than one year, and cross Earth’s orbit near their aphelion (their farthest distance from the sun). It may seem at first that with so many Earth-crossing asteroids, a devastating collision would be inevitable. But, the asteroids do not orbit in exactly the same plane as the Earth’s. In most cases, their orbits never actually intersect, and therefore they can never collide. There are only a handful of known, relatively large Earth-crossers that pose potential danger for collision in the distant future. However, astronomers can accurately compute the future positions of these asteroids and have determined that none pose any realistic threat in our lifetime. A number of smaller Earth-crossing asteroids may yet be discovered. But smaller asteroids would cause less damage upon impact, and the smallest ones burn up in Earth’s protective atmosphere before they can reach the surface. An especially interesting group of asteroids is called Trojans. The majority of these asteroids orbit at the same distance from the sun as Jupiter. Consequently, they have an orbital period of just under 12 years—the same as Jupiter. The Trojans generally orbit in regions that are 60 degrees ahead of Jupiter or 60 degrees behind the planet. These locations are the L4 and L5 Lagrangian points respectively—locations of gravitational stability that form an equilateral triangle with the sun and Jupiter.3 The Trojans are so named because they “hide” in the orbit of Jupiter like the Greeks who hid in the wooden horse in the story of the Trojan War.4 Nearly 6,000 Trojan asteroids have been detected.5 Curiously, those in the leading L4 group outnumber those in the trailing L5 group by nearly 2 to 1. Recently, astronomers have discovered that Jupiter is not the only planet to have Trojan asteroids sharing its orbit, though it certainly has the most by far. The asteroid Eureka, discovered in 1990, was found to occupy the L5 Lagrangian point of Mars. At least three other Mars Trojans have been discovered since then. Earth has one confirmed Trojan, the tiny (1,000-foot-diameter) asteroid 2010 TK7. Venus and Uranus each have one confirmed Trojan, and nine Neptune Trojans have been discovered. At their closest approach to Earth, the brighter comets are easily visible to the unaided eye and have been known since very ancient times. Until the late 1500s, comets were thought to be atmospheric phenomena. But the astronomer Tycho Brahe was able to measure the distance to a comet for the first time in 1577 and showed that they are far beyond the distance of the moon and are therefore celestial. Some of the more spectacular images of comets show a long tail of debris that may extend millions of miles into space. But the source of that debris, called the nucleus, is typically only a few miles in diameter. Surrounding the nucleus is a nearly spherical cloud of gas and dust called the coma. When comets first reach the inner solar system, the coma usually develops before any tail. Often, comets never develop a visible tail at all but appear as small spherical clouds in a backyard telescope. The brighter comets generally do form a tail and usually two tails that differ by color. A light blue ion tail is narrow and always points directly away from the sun. This tail is composed of low-mass charged particles (ions) that are heavily influenced by solar wind. The ion tail is also called a plasma tail or gas tail. A white or yellowish-white dust tail is also present in many comets. Since dust particles are heavier than ions, they are launched into their own orbits that differ slightly from the comet’s orbit. For this reason, dust tails are often curved—their particles are following Kepler’s laws. Dust tails are usually wider and can be far more complex than ion tails. They can even fan into multiple tails in some instances. When Comet Hale-Bopp approached Earth in 1997, it beautifully manifested a blue ion tail and a white, curved dust tail. But some comets show only one of these two tails. In 1977, American astronomer Charles Kowal discovered a minor planet orbiting in the outer solar system between the orbits of Saturn and Uranus.10 The object was named Chiron and was the most distant asteroid known at the time. As this asteroid approached its perihelion, it developed a coma—much to the amazement of astronomers. Yet Chiron is estimated to be 80 miles in diameter—far larger than any known comet but right in line with asteroids. This new object seemed to exhibit characteristics of both an asteroid and a comet. And it wasn’t alone. Astronomers have subsequently discovered several hundred other minor planets in the outer solar system that are similar to Chiron. This new class of object is now called a centaur.11 Centaurs are minor planets that orbit between Jupiter and Neptune.12 Minor planets that orbit beyond Neptune are classified as trans-Neptunian objects (TNOs), whereas minor planets that orbit closer to the sun than Jupiter does are classified as asteroids. The complexity and sheer beauty of our solar system inspire a sense of awe and wonder. We have a sun that emits heat and light equivalent to 4 trillion-trillion 100-watt light bulbs. We have eight planets, each with its own marvelous characteristics and beauty. We have discovered 173 moons in total orbiting these planets. And we have hundreds of thousands of small solar-system objects—asteroids, centaurs, TNOs, and comets. If the solar system had been the only thing God created, it would certainly be a praiseworthy achievement. But our sun is merely one of over 100 billion stars in our galaxy. And we estimate there are over 100 billion galaxies in our universe. We now know that some of these stars have orbiting planets. Over 1,000 extra-solar planets have been detected, and in a handful of cases, they have been directly imaged. It boggles the mind to contemplate the possibility of billions of solar systems, each with treasures far different from our own. We are only at the very beginning of our exploration of God’s universe. Who can guess what undiscovered gems the Lord has placed among the stars for our delight and His glory? Pallas is 360 miles across at its widest point, and is not quite round. Pallas orbits at about the same average distance as Ceres, and consequently has the same orbital period of 4.6 years. But unlike Ceres, Pallas has a fairly elliptical orbit that is tilted to the plane of Earth’s orbit by 35 degrees. What Are Atiras, Atens, Apollos and Amors? NASA Near Earth Object Program FAQ. Posted on neo.jpl.nasa.gov, accessed March 1, 2014. As a matter of definition, the L4 point leads Jupiter by 60 degrees and the L5 point trails Jupiter by 60 degrees. The three remaining Lagrangian points L1, L2, and L3, are unstable equilibrium points, and are therefore not expected to contain asteroids on any permanent basis. Those Trojan asteroids in the L4 group are named after Greek participants in the Trojan War, whereas those in the L5 group are named after those on the side of Troy. There are only two exceptions; Patroclus and Hektor are in the “wrong” camp because they were named before the convention was adopted. List Of Jupiter Trojans. The International Astronomical Union Minor Planet Center. Posted on minorplanetcenter.net, accessed January 27, 2014. Solar wind is a stream of charged particles (mostly protons and electrons) that have been released from upper atmosphere of the sun. Halley’s Comet is a notable exception. It is a short-period comet with a period of 76 years, yet it has a retrograde orbit. Comets are named after the person or persons who discovered them. 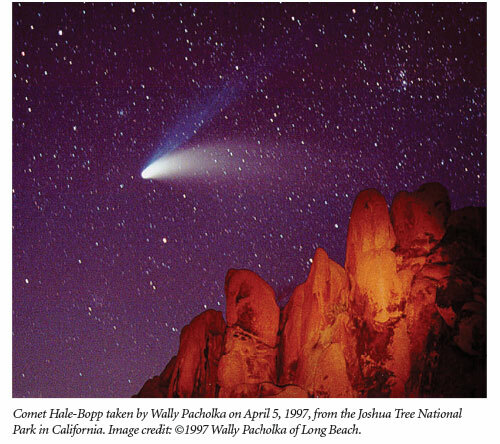 Comet Hale-Bopp is named after Alan Hale and Thomas Bopp. To rescue the notion of billions of years from this evidence to the contrary, secular astronomers have proposed an Oort cloud, a hypothetical, enormous, spherical cloud of comet-size icy masses. These icy objects supposedly orbit far beyond Neptune and are occasionally dislodged from the Oort cloud and thrown into the inner solar system, thereby becoming a new long-period comet. The Oort cloud is therefore supposed to resupply long-period comets as the old ones evaporate, all over billions of years. Likewise, the Kuiper Belt is supposed to contain trillions of progenitor comets just beyond Neptune that resupply the solar system with short-period comets. However, neither the Oort cloud nor a genuine Kuiper Belt with trillions of comet-size mass have been observed. Chiron’s orbit is elliptical and briefly brings this little world closer to the sun than Saturn, and then farther from the sun than Uranus. Chiron spends most of its time in between the orbits of Saturn and Uranus. The term centaur refers to a creature from Greek mythology that is half human, half horse. Likewise, solar system centaurs seem to be a hybrid between asteroids and comets. To be precise, the average distance of a centaur from the sun must be greater than that of Jupiter and less than that of Neptune. Most centaurs cross the orbit of one or more of the outer planets. Cite this article: Jason Lisle, Ph.D. 2014. The Solar System: Asteroids and Comets. Acts & Facts. 43 (5).